Call of Duty: WW2 features classes in the form of Divisions. Here's all the info you need on every group that you'll find in the multiplayer side of CoD WW2 Divisions. In CoD WW2, the multiplayer class systems are divided up into Divisions, five base classes which you can then take and refine in order to better suit your playstyle. 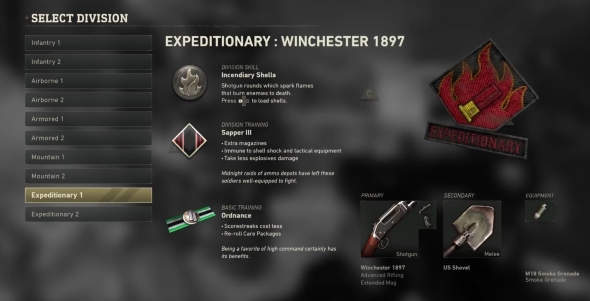 This has previously been called Create a Class, Pick Ten, and Rigs in previous Call of Duty games, but in Call of Duty: WW2, you'll have to choose between five classes, and then select from a limited amount of skills. If you're still confused, we're here to sort everything out with this CoD WW2 Divisions guide, as well as pointing you in the general direction of the best CoD WW2 Divisions. 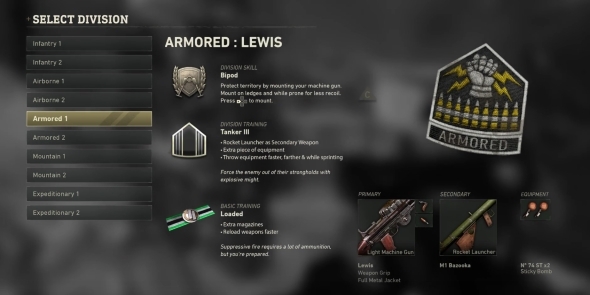 If you need a more general guide on everything on offer on the multiplayer side of Call of Duty: WW2, make sure to check out our Call of Duty: WW2 multiplayer guide, where you can find info on all the best weapons in the game, as well as every map we've played so far. The brand new Resistance DLC Pack 1 for Call of Duty: WW2 is now live for the game as of January 30, 2018, for a full breakdown of the brand new Nazi Zombies content featured in the new expansion, head over to our CoD WW2 Zombies Darkest Shore guide. Each of these Divisions specialise in a certain area of the battlefield. We'll explain more about their roles further down, but Divisions like the Armored class specialise in heavy weaponry, while the Mountain class feature powerful spiner rifles. Division Skills - These are active abilities that you can use in the heat of battle. Division Training - Passive abilities that can alter your role on the battlefield. Basic Training - A range of selectable Perks that further define your character and role. Now that you've got all the basic info on how Call of Duty: WW2 Divisions work, we'll delve into detail on each class subset, as well as all the Skills and Perks you can unlock for each division type. Call of Duty: WW2 Infantry Division equipment and Skills. 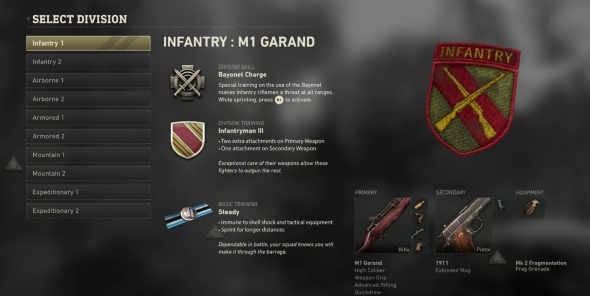 As you might expect, the Infantry Division in Call of Duty: WW2 is the best all-rounder in combat, able to use distance rifles like the M1 Garand to lay down fire on targets from behind cover, while also having several Skills and Perks like the Bayonet to deal with targets up close. Bayonet Charge - This nice skill allows infantrymen to charge at opposing soldiers, skewering them with a sharp bayonet. Infantryman III - Two extra attachments on your primary weapon, as well as one extra attachment on your secondary weapon. Steady - Immune to shell shock and tactical equipment, allows you to sprint for longer distances. Hunker - Reveals enemy equipment, you also take less explosion damage. Call of Duty: WW2 Airborne Division. 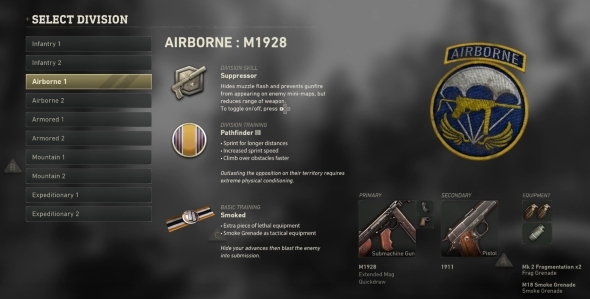 The Airborne division in Call of Duty: WW2 generally rely on speed to mount an assault, favoring fast-firing sub-machine guns and rapid movement over everything else. They can run and gun, but can also equip suppressors on weapons in order to get the drop on their enemies. Supressor - Hides muzzle flash and stops gun fire from appearing on enemy radar, but limits the range of the weapon. Pathfinder III - Sprint for longer distances, increased sprint speed, climb over objects faster. Smoked - Carry an extra piece of lethal equipment, and smoke grenades can be carried as tactical equipment. Phantom - Quieter movement, take no fall damage, you're invisible to enemy recon aircraft while moving. Call of Duty: Armored Division. The Armored Division in Call of Duty: WW2 perform exactly as you'd expect them to, packing a heavy punch with weapons like light machine guns and rocket launchers, perfect for laying down suppressing and lethal fire on a certain map point. Bipod - Stabilises your weapon, mount on a ledge or while prone for increased weapon stability. Tanker III - Carry a Rocket Launcher as a secondary weapon, carry an extra piece of equipment, and throw equipment farther and faster while sprinting. Loaded - Carry extra magazines, reload weapons faster. Scoped - Move faster while aiming down weapon sights, gain an extra attachment on your primary weapon. Call of Duty Mountain Division. 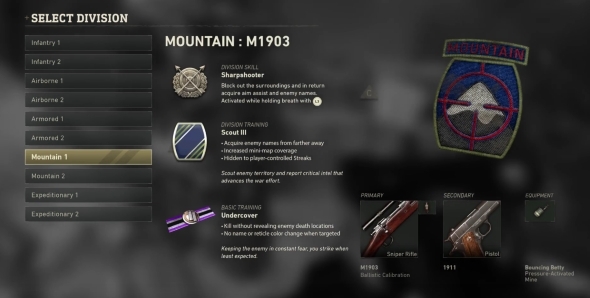 If you were wondering where Call of Duty: WW2's sniping class had got to, then rest assured, for it features in this iteration of Call of Duty in the form of the Mountain Division. They have the only form of aim assist in the entire game, but every shot from their slow firing rifles needs to count. Sharpshooter - Acquire aim assist and enemy names, at the cost of blocking out your surroundings. Scout III - Acquire enemy names from farther away, increased mini map coverage, you're hidden to player-controlled streaks. Undercover - Kill without revealing enemy death locations on the mini map, your name never appears on enemy scopes, enemy reticles never change color while you're in their sights. Forage - Swap weapons faster, throw equipment faster, resupply ammo and equipment from dead enemies. Call of Duty: WW2 Expeditionary Division. The Expeditionary Division are the ones that will be on the front lines of the fighting in Call of Duty: WW2. Armed with shotguns and other close quarter weaponry, the Expeditionary Division can take out foes with a single, well placed shot, as well as re-rolling unwanted Care Packages with the right Perk. Incendiary Shells - Shotgun rounds that can burn enemies to death. Sapper III - Carry extra magazines, you're immune to shell shock and tactical equipment, and you take less explosive damage. Ordnance - Scorestreaks cost less, and you can re-roll Care Packages. Duelist - Gain two attachments on your secondary weapon. Our sister channel Outside Xbox playing Call of Duty: WW2. That's the complete rundown on all the information for Call of Duty: WW2 Division classes, but head over to our Operation Shamrock and Awe event guide for all you need to know about the latest Community Event for Call of Duty: WW2.